Kathleen Kelly (Meg Ryan) is cute. She tip-toes around her apartment in pjs and waits for her anti-techy boyfriend (Greg Kinnear) to leave for work before plugging in her laptop. When the computer informs her, "You've got mail," she repeats the words and grins. Her hair is mussed-up. She runs a small children's bookstore in New York City called "The Little Shop Around the Corner" that she inherited from her mother. The bags she gives away are canvas and reusable. Weekends she dresses up in funny hats and reads stories to rapt children. But...trouble in paradise. The gargantuan Barnes & Noble-esque chain, Fox & Sons Book Company, opens a superstore across the street. Kathleen's so sweet she doesn't even register this as a threat. She thinks their section of New York might become known for its bookstores; tourists will arrive en masse and all the bookstores will be able to coexist peaceably. To the movie's credit, this doesn't happen. Despite a media campaign started (unethically) by her journalist-boyfriend, her shop goes under. She is left without livelihood. To the movie's discredit, this isn't seen as a bad thing. She becomes a writer of children's books so her fortunes improve. When she finally visits the demonized Fox & Sons, there are good books and good muffins and cute kids sprawled over the clean carpet, reading. It seems like her store only larger. The only problem is that Fox & Sons employees don't know books as well as she does. A customer, asking after such-and-such a title, is greeted with a "Huh?" from the employee, whereupon Kathleen, blubbering, leads them to the correct choice. In the wings, Joe Fox III (Tom Hanks), scion of the superstore chain, grimaces in embarrassment for the incompetence of his employees. Hey Joe! Maybe if you paid your employees more you could retain those with specialized knowledge. Minimum wage leads to minimum talent. Almost all customer service employees in You've Got Mail are portrayed negatively. There is a nasty, gum-chewing grocery cashier who refuses Meg Ryan's credit card in a "cash only" line, plus an elevator operator who deals with a stalled elevator by pushing all the buttons for the various floors. It's up to Joe Fox III to calmly come to the rescue by picking up the phone. Has Hanks ever been so annoying? It's not even his character that bothers me; it's him. One gets the feeling that the suspect morality of the film  business is business, and chains will ride roughshod over independents in the new global marketplace, but don't worry because Tom Hanks is in charge and he's a good sight better than his father and grandfather  didn't even register with the $20-million-per-picture actor. It certainly didn't register with the filmmakers. Kathleen Kelly uses America On-Line, the Barnes & Noble of ISPs, and drinks coffee at Starbucks, the Barnes & Noble of coffee shops. Where's the movie about the coffee shop around the corner that goes bankrupt because Kathleen Kelly drinks Starbucks? This isn't a romantic comedy about people, it's a romantic comedy about business. Fox, by the way, is as cute as Kelly. He owns a nice big dog and spends a happy day with two kids, relatives, who turn out to be  because of the sexual shenanigans of his father (Dabney Coleman) and grandfather (John Randolph)  his brother and aunt. This doesn't bother him. He's a big kid himself. He owns a boat. He philosophizes on the internet, where, in a chatroom, he meets "shopgirl" (Kelly, of course). The two develop a hot, anonmymous internet romance while making faces at on one another in real life. When will they find out? Oh when. Fox also lives with a girl played by Parker Posey. Hanks seems her uncle, if not her father. Such a weird pairing. Once again Hollywood tosses together an unlikely couple in order to break them up. Pretty Woman, one of the big romantic comedies of the '90s, was a dishonest film but at least its happy ending required the female lead to humanize the male lead. 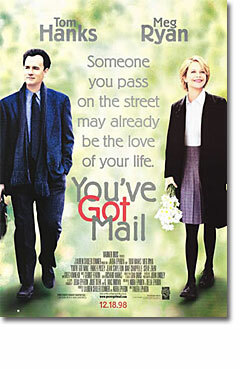 What does the happy ending in You've Got Mail require? If anything he changes her. In the coming years Fox & Sons Book Company will open a hundred more stores and make millions more dollars and put thousands of independent booksellers out of business, but because he's got a big dog and plays with kids and quotes from The Godfather, we're not supposed to mind. We do.